Summer 2019 Availability: Sat 6/8- Sat 6/15, Sat 6/22 - Fri 6/28, Mon 7/29 to Mon 8/5. This one level contemporary is located just 10 minutes from the villages of East Hampton and Amagansett. 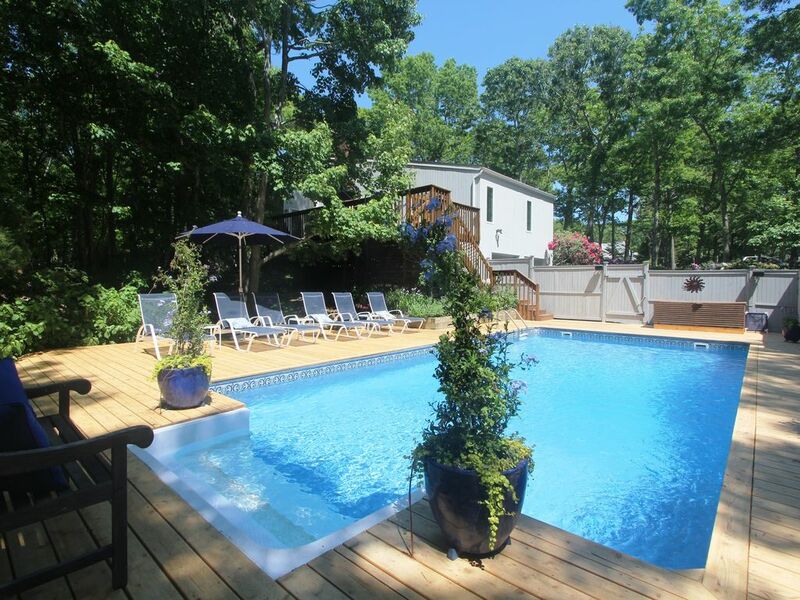 It is situated on a private, beautifully landscaped and wooded lot bordered by a nature preserve. For the past 18 summers, guests have raved about this home (see Guestbook comments). You will find that It is immaculate and tastefully furnished, and has a spacious, bright living room with a cathedral ceiling and fireplace and a sunny kitchen with skylight with seating for 8 to 10 people. The living room with fireplace is flanked on one side by the master bedroom suite with king-size bed, en suite marble bath, TV/DVD player and access to the deck, affording you the privacy you desire, and on the other side of the living room there is a hallway to three additional bedrooms and shared bath. The kitchen has granite countertops, stainless steel appliances and terra cotta tile floor and all of the cooking and dining accessories you will need and desire. In addition to central air conditioning throughout the house, the living room and each bedroom has a ceiling fan to help cool the rooms. A washing machine and dryer is conveniently located on the main level. The house has a large upper deck, accessed by four sliding glass doors, with patio dining furniture for 8 and gas grill, and a lower deck with in-ground swimming pool surrounded by beautiful, flowering landscaping and an enclosed outdoor shower. There are 6 chaises, an umbrella, and pool rafts. There is also a two car garage with direct access to the basement making it convenient for you to enter the house, bring in your bikes and access the basement refrigerator from the pool area. Beach chairs and umbrellas, a highchair and two bikes are also available. I currently reside in Manhattan, but enjoy my home in the off-season when it's not rented. I own a home staging business where I help home sellers make their homes look their best in order to sell quickly and for the best possible price. The Hamptons are a great location to be in - whether to live or to visit. I fell in love with East Hampton while living out there for a summer and working at a bed and breakfast to see if buying and owning a B&B was what I wanted to do. Well, I decided it wasn't for me, but I ended up buying a house out there instead. What is so great about it is that it is the perfect combination of New York City people, culture, restaurants and shopping AND some of the most beautiful natural scenery in this country: beach, bays, blue skies, beautiful hiking trails, and more. I love going out there all year round - the off-season in Fall and Spring are the best. Located close to bay beaches, scenic vistas of the bays and Accabonac Harbor for fishing, boating, paddle boarding and kayaking, as well as close to the Springs Historic District with the Pollock Krasner House, a general store with Adirondack chairs and picnic tables to enjoy your breakfast and lunch, a Saturday farmer's market and frequent art shows. We are a few minutes drive to beautiful, calm and warm bay beaches, and a 12 minute drive to the nearest ocean beach which is Atlantic Avenue Beach in Amagansett. Beach towels are not supplied. In addtion to two car garage, there is roomm for at least another 3 to 4 cars in driveway. Also there is another driveway on other side of house for 2 cars. Two-car garage attached with direct access to basement for storage of your bikes and kayaks. Newly renovated with granite countertops and stainless steel appliances. The house has no lawn, but it does have beautiful landscaping in a wooded setting. Upper deck with access from master bedroom, living room and kitchen. There is an upper deck with table/umbrella and seating for 8 and a lower deck around the pool with 6 chaises and umbrella. Also has enclosed outdoor shower. Pool rafts provided. 6 chaise longues and an umbrella. 2 car attached garage; beach chairs & umbrellas; 6 chaises around pool; pool rafts; DVD/CD surround sound system including outdoor speakers by pool. Spent two night here for a girls weekend of 8 ladies and we absolutely loved it! Such a cozy home with all the amentaties we needed! Thank you Donna 😀 would for sure stay again! Both Donna and the house were wonderful, I would highly recommend staying here. Had a great time with several friends in this very comfortable home that was close to town and and great restaurants. Donna was extremely accommodating and helpful in providing information on the area and where to go and the house was very clean and well maintained. You won't be disappointed staying here! Had a really lovely stay with a few girlfriends - such a clean and well-kept house, and the pool was a great plus. Donna made sure we were all set for our vacation and even recommended a few activities in the area. The house was well-stocked with everything we needed, with the town a very easy drive away. Would absolutely recommend for anyone looking to get away! Thank you. I am glad you enjoyed the house. Thank you for taking good care of it too. We had a great week. The pool area is beautiful, lovely landscaping. The neighborhood is peaceful and only 10 mins to town. Donna was very responsive to any questions we had and the house is very comfortable. Had a great time here. Highly recommend. We had a great time and higly recommend the house. We had 2 families including 5 kids - place was very comfortable with plenty of space. The house is clean and well equipped - has everything one might need. Pool is great shape as wel. Donna was great host, responsive and flexible. Would stay there again. Brad, thank you for your nice review. I would have you back any time. You were easygoing and took great care of the house. We had a great ten days at this house. Furnishings were nice and very comfortable and the pool was really nice. While the location is a bit of a distance from downtown East Hampton, we ended up discovering new things to do and some beautiful views up in the Springs. Owner was great to work with, patiently answering all of my questions and providing us with lots of suggestions for things to do, restaurants, etc. All in all, we had a great experience. Thank you for your nice review, Tina. Glad you enjoyed your stay. Minutes away from bay and ocean beaches, this home is located in a quiet, woodsy upscale section of the Springs area of East Hampton, a town that combines small town charm with natural beauty as well as the sophistication of upscale stores and restaurants.Springs is known as the home of famous artists like Willem DeKooning and Jackson Pollack whose home is nearby and is open for tours. It's also close to the Springs Historic District with its charming General Store. The many things to do in the Hamptons also include antiquing, golf, tennis, fishing, horseback riding, surfing, windsurfing, hiking, boating, jet skiing, biking, kayaking/canoeing, viewing wildlife, historical sites, live theater and concerts. REDUCED RATE FOR 3 NIGHT STAY IN OFF SEASON WEEKEND RENTALS NOT ACCEPTED IN JULY AND AUGUST NO PETS, PROM GROUPS OR WEDDING RECEPTIONS, PLEASE. Weekly and bi-weekly renters are responsible for paying electric above $75 per week. Monthly renters are responsible for paying electric, phone, cable, internet, 2x weekly garbage pick up, weekly pool service and periodic weeding and if necessary, yard cleanups. Sales tax of 3% will be added to rentals of less than 30 days.